It really feels like Microsoft wants me to continue playing games on my PS3 rather than my 360. At least, that’s one conclusion to which I can arrive after trying to play BattleBlock Theater. I hadn’t really played my 360 in a couple years. The PS3 had more exclusives about which I cared, is quieter, doesn’t make me worry about failing hardware, has an easier to use and less intrusive interface, is more popular among my friends, and (most importantly) has a d-pad that actually functions. When I bought an HD TV for the first time back in November, I moved my 360 upstairs from the downstairs living room where it used to live. I played a little Johnny Platform’s Biscuit Romp, an Xbox Live Indie Game without even updating the console and then didn’t use it again. Last week, Behemoth’s third game was released. Of course, this is the glorious BattleBlock Theater! I was very excited. I read that it was released on Xbox Live, so I checked if it was released on PSN as well. It wasn’t. That was fine by me. I had something to do at home that night, but in my free moments, I worked on getting BattleBlock Theater downloaded. First I had to update my 360. That was expected honestly, and it went smoothly. After the update, I tried to log into Xbox Live and was told I needed to update my security on my account. It gave me the choice of setting up an e-mail, text message, or call. I already had a second e-mail address on file, so I set up a text message. After typing in my number, I received a text message with instructions to do something online. After confirming, I expected to be able to continue. “Not so fast,” said Microsoft. It still wanted me to add more security. Having fulfilled the other two options, I chose a phone call. Microsoft called me, I answered, they gave me a confirmation code, and I confirmed it in my 360. There. Everything done, right? No, it gave me the same prompt. I fooled around for a while with various choices until I realized what I had to do. In the menu of security choices, it displayed that the ‘A’ button was used to select and ‘B’ was used to go back. I had to go back. Apparently I was stuck in the security screen. Ugh! Next, it was time to download the game. The progress percentage would slowly increase, and then it would stall without increasing. After about 10 minutes, I’d get an error about getting disconnected from Xbox Live. Navigating through the Xbox 360 interface was a hassle because it seems to take a half second to load each submenu, but I could reconnect to Xbox Live. I’d get another 10% through before it would happen again. I ended up going to sleep with it downloading because I couldn’t stay up to let it finish. This was a risk because I’d rather not have my 360 get the red ring. When I awoke in the morning, I was disconnected from Xbox Live (no surprise), but BattleBlock Theater had finished downloading! Of course, I was off to work, but in the evening I knew I’d get to enjoy the game. That night I turned on my 360 and logged into my account. Then gem turned on the second controller and logged into her account. She went through the same security hassle, but at least we knew to back out of it. I really thought we were getting close to playing, but I had been disconnected from Xbox Live. I logged back in, and then gem was disconnected. gem connected, and it booted me again. After a few more tries, we both got connected at the same time. I tried playing, but it disconnected while I was in the game. I might not have needed to be logged into Xbox Live, but I wanted to be, so I setup the network settings again. Now, finally, gem and I were both connected to Xbox Live, stable, and ready to play. I did manage to play a little bit during that sitting, but I don’t want to talk about the game itself in this post. However, I saw in the new, ugly Windows 8 “modern UI”-style interface the ability to pin games. I thought, “oh, this is a pretty great feature! That interface isn’t so bad if I can do this!” I pinned BattleBlock Theater and went back to the home screen to look for it. Was it pinned right there to the first screen you’d see? No. It’s pinned under “My Pins.” That’s a little more helpful, but Microsoft should have let games be pinned directly to the first screen seen. It seems like a terrible missed opportunity. The next time I booted my 360, it was unpinned. I pinned it again, and then tried to pin some other games. Everything pinned fine except one particular XBLA game that took 10 minutes to pin. They should ditch the majority of the interface and just use the interface that appears when you press the Guide button on the controller. That features menus and no adds or unnecessary screens. As you might guess, I was a fan of the original blades interface. Thank you for the fantastic console and stellar interface design, Microsoft. And if you’re wondering about BattleBlock Theater, it’s absolutely fantastic. I’ll talk about it later in its own post! David Hayter, voice for Snake up until now, has made a heartfelt post about not reprising his role in Metal Gear Solid 5. He writes that when he heard that recording sessions had begun, he contacted someone involved with the production. After meeting with him, he learned that they “wouldn’t be needing [him],” with no further explanation. David Hayter seems like a really fun guy to me. I met him at Anime Expo 2008. When I got his autograph, I asked him, “Do you ever use the Snake voice in the bedroom,” to which he replied, “on occasion.” I asked, “How’s that work out for you?” “Works every time,” he answered. And he answered in the Snake voice of course. 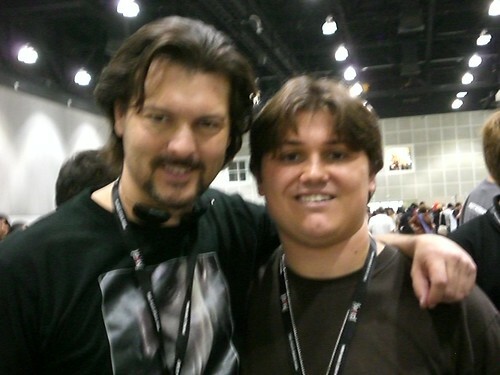 Yes, that’s me with David Hayter by the way. The photos kind of blurry, and everyone knows blurry pictures make you look fat. I have been up in Toronto, for the past eight months, directing my first film, (WOLVES — 2013, TF1/COPPERHEART). On the December break, I came home to Los Angeles for the holidays. I heard then, that recording sessions for MG:V were being put together. But I didn’t hear anything about whether I’d be needed or not. So, I got in touch with someone involved in the production. We got together for lunch, and he told me that they “wouldn’t be needing me” on this game. No reason, or explanation was given beyond that. I drove home through Laurel Canyon, bummed, and thinking about Snake. To be clear, I love being a part of the world of Metal Gear. I admire its technological innovations, the gameplay, the political message of it all. But primarily, I love the fans of these games. Two grown men burst into tears upon meeting me at the Vancouver Fan Expo last year. Now that… Is a rare and excellent role. You know you’re making an impact. And I love doing it. In 1998, I tried to do come up with a voice which epitomized the kind of worn, put-upon, genetically-engineered clone-soldier that I saw Snake to be. Over time, as the games became more stunning and visually sophisticated, I tried to transition that initial voice into the increasingly real environments in which Snake found himself. My level of success is up to you, but any perceived deficiencies were not for lack of hard work. I have dedicated a huge amount of time and effort into creating a compelling character, capable of expressing the myriad emotional, physical and psychological hurdles that Snake has to face. Anyway, now it’s been fifteen years, nine games, and an enormous blast to undertake. If it were my choice, I would do this role forever. To hear anyone else’s voice coming from Snake’s battered throat, makes me a little ill, to be honest. But the truth is — it’s not my choice. Any and all casting decisions are the sole purview of Hideo Kojima, and Konami itself. And that’s fair. And I’ll get by. I am not lacking for employment on any level. But I didn’t want anybody to think that I was intentionally abandoning them. And know that I will miss this job, and this character, very much. via David Hayter: Hearing someone else as Snake ‘makes me a little ill’, Jessica Conditt, Joystiq, 4/1/13. That means that 45.1% of the games I own have been marked null. I do this when I’ve decided that I’m finished yet haven’t beat the game, which happens if I don’t think it’s worth continuing to put my time into the game. I also mark duplicates null. I’ve beat, completed, or mastered 30.0% of my owned games, leaving 24.9% of my games unbeaten with 77.1% of those games never even played. Despite being angry with EA for changing the way DLC is handled in the game, making it impossible for me to download DLC that I’ve already purchased, I’ve continued playing Surviving High School. I finished The New Girl and A New Start season 1 megapacks and have been keeping up to date with A New Start season 5. In addition, I’m a quarter of the way through classic season 1. Last weekend I got to spend a couple hours playing Borderlands 2 with my friend Joe. It had been a long time since I’d played a console game besides New Super Mario Bros. U, and I had never played the original Borderlands. However, I really enjoyed it and didn’t seem too lost. I don’t think the story really mattered. I’d heard that it was similar to Diablo, and that was very accurate. Borderlands 2 has the hack-and-slash, dungeoneering feel of the Diablo series with the mechanics of a first-person shooter. It’s all about getting better loot, and progressing through quests seemed secondary. I really enjoyed it and wouldn’t mind playing it more. While I only play this once in a while, I’m still chugging away at it. I’m currently in the fifth world. It reminds me strongly of Super Mario World. I reviewed this FBI thriller, point-and-click adventure for Game Boyz. gem played with me because she loved the subject. It was really exciting, and I’m looking forward to the next episode’s release on iOS. Here’s another iOS game that I reviewed for Game Boyz. It’s a strategy board game that’s pretty fun. There are a variety of challenges, and I struggled even during the tutorial set. It works well as a pass-and-play multiplayer game. SMB2 is a good time waster. I gave up on the first iPhone game when it got annoying. You have to beat 10 levels for it to save, which just seems like bad design. We’ll see if this one annoys me too. Why are some of Popcap’s games so amazing and others only mediocre? Solitaire Blitz is pretty much Tri Peaks solitaire with a bunch of stacks rather than triangular arrangements of cards. In addition, you can unlock multiple waste piles as you play. Being a free game, Popcap has in-app purchases that I avoid. I won’t go into detail about WoW here considering I have a blog devoted to it, but we finished tier 14. I’ve completed the first two wings of the tier 15 in LFR but we haven’t entered the Throne of Thunder yet on normal. I’m still working on 5.0 reputations but am finished with 5.1 and 5.2 reps. I’ve also been enjoying the Isle of Thunder. The strange tale of "bob's game"